Yesterday I talked about the Lacy Stripes Knit Shawl, which I have already vetted as an amazing pattern, you should look at it immediately! I wanted to talk a knit further about the construction of this shawl, if you look at a finished product, it looks like a scalene triangle. Now that I have scared everyone with flashbacks from grade 9 math, I’ll explain why this is a good thing. A scalene triangle comes in many shapes and sizes, but it essentially means all three sides are different lengths. This is the particular shape I’m talking about though. This shawl construction has been getting a lot of traction and I couldn’t be happier about it. 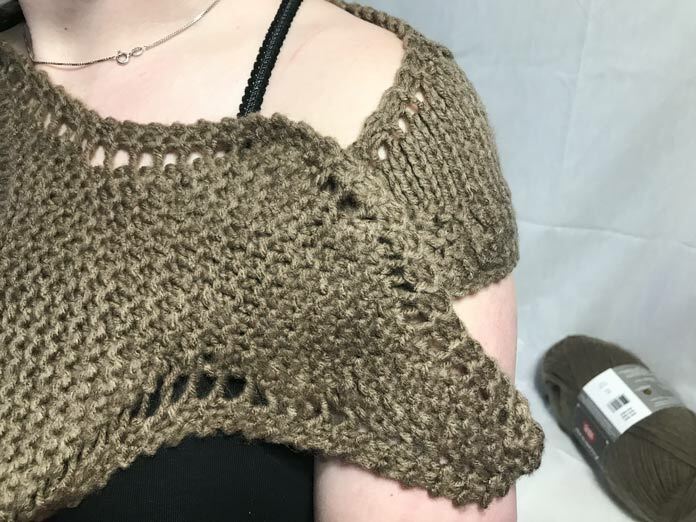 With one side being a very small angle than the other side, this means the longer side keeps the shawl on your shoulders and curls around you. Shawl pins are amazing, and there is still a need for them, believe me, but these shawls are perfect for the one you just want to throw on and go. This kind of shawl will be the one you keep at the office, the one you store in your diaper bag, the one you take travelling. In other words, a very practical shawl for any where and any occasion. With the top layer moved away, you can see the edge of the shawl sitting flat on my shoulder. It curls around and hugs the curve of the shoulder. 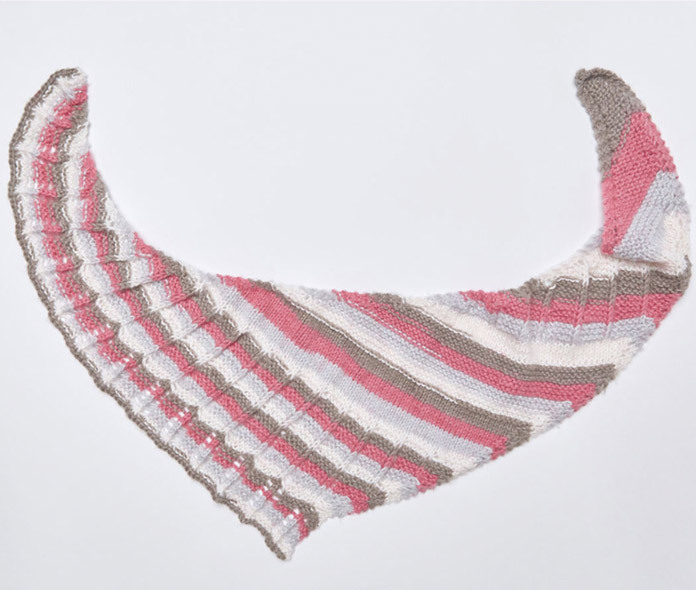 I specifically mentioned that I liked this shawl knit from the Dreamy Stripes yarn. When you’re knitting an asymmetrical shawl from a self-striping yarn the stripes highlight how the garment comes together and progresses. You can see this clearly in the photo below. The cast on edge is the one on the right where the stripes are larger. The stripes progressively get smaller as the shawl becomes wider. I think this creates a really neat effect of stripes that aren’t all the same size and asymmetric stripes on an asymmetric shawl looks pretty neat. The stripes hint at how this garment is constructed. You can see how they are thicker on the right. Whether you’re going for a solid color yarn or you choose the striped option this shawl is going to look beautiful. Now you’ll be able to tell the difference between the two different yarn styles and how they make the shawl look. Now you’re able to make an informed decision about your yarn choice. What version do you like better? Stripes or solids? 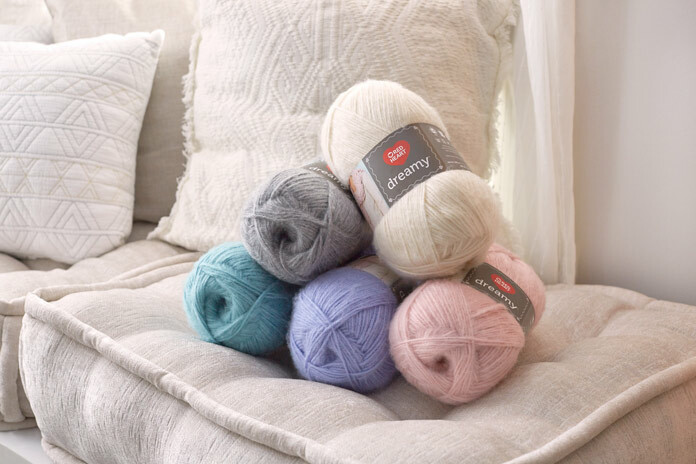 Just looking at Red Heart Dreamy yarn Solids makes you cozy all over. Moot point perhaps, but I beg to differ that scalene triangles come in different shapes. 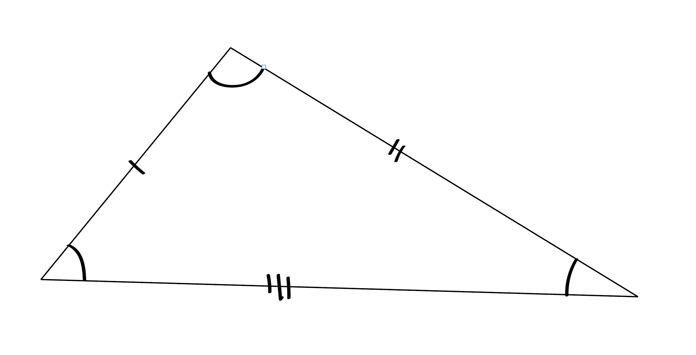 the shape is a triangle. Yes, they do come in different sizes though.